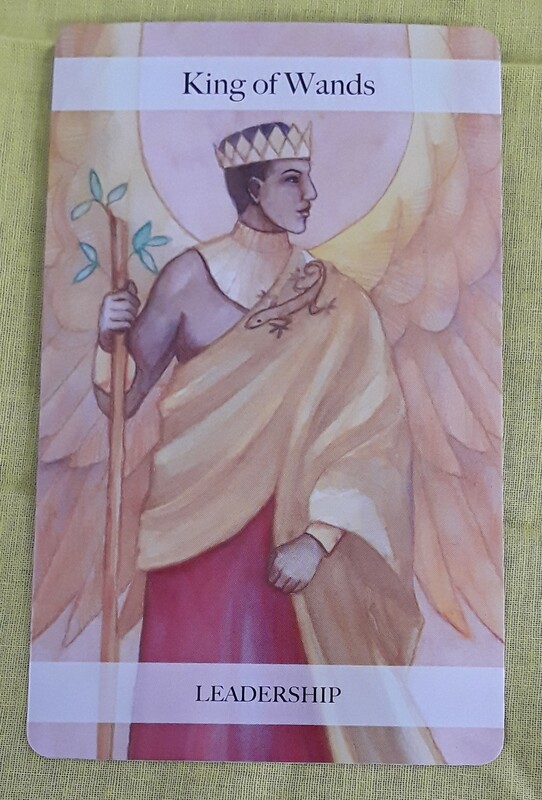 The Tarot cards for today are the King of Wands (Leadership) and the Ten of Pentacles (Support). This may be a time when others are looking to you to lead the way. In this case, your leadership is needed in the areas of work, money, family matters, and people other than family who are in your inner circle. 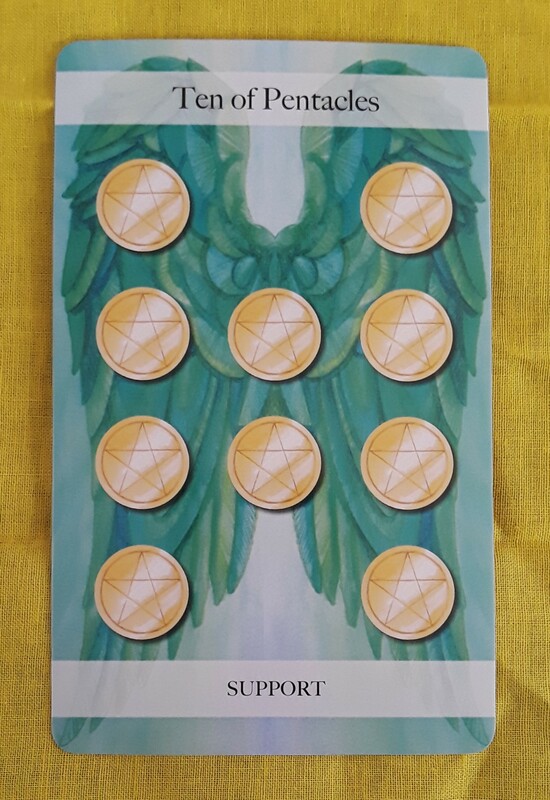 By the same token, today’s card could relate to someone close to you who will be a strong source of support for you. The Tarot card for today, Saturday, and Sunday is the Ten of Pentacles. To put it simply, just enjoy the weekend. Spend time with people who are close to you — family, good friends, loved ones of all types. Eat well. Laugh. Share intimate moments. Appreciate all that is right in your life. 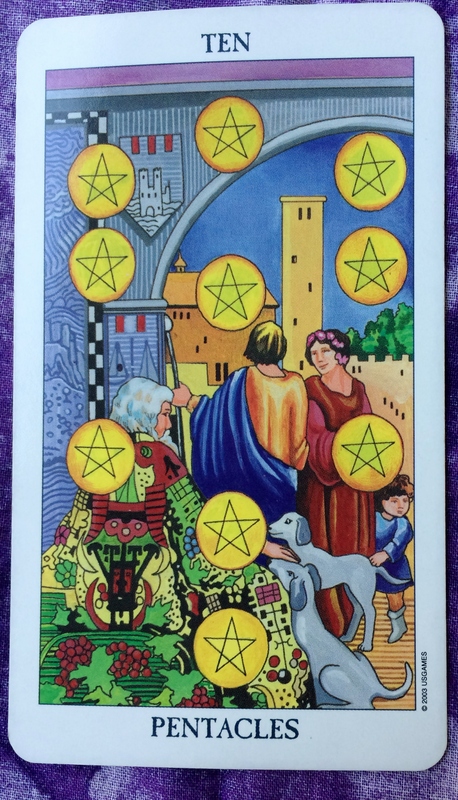 The Tarot card of the day is the Ten of Pentacles. This card represents abundance and a thriving household. But it also is a reminder not to take anything for granted. In what ways are you abundant that you may not have thought about? Are you living in a safe, secure environment? Do you have access to sunlight and/or clean drinking water? Can you spare a dollar for a beggar, whether you choose to give it to him/her or not? Are you reading this post on a device that can access the Internet? You may not have everything you want the way you want it. But even your awareness of how you feel is a huge asset. Many people are sad and dissatisfied and don’t know it. They think that not enjoying life is “normal.” Awareness of the things we would like to change is one of the most valuable treasures we have. Through this awareness, we can find the motivation to grow and evolve. The Tarot card for today is the Ten of Pentacles. This is a day to enjoy any peace, harmony, and abundance that you have as it relates to your home and material comfort. In your world, if things are not perfect, take just a few minutes to detach from your worries and be thankful for at least one thing that is going right. If you can think of more, by all means keep going. But if not, hold on to that one thing and build upon that. Live your life completely and don’t take anything for granted. Today’s card is the Ten of Pentacles. You have a lot of positive things going for you when it comes to your home situation. But sometimes the problems you have in other areas of your life may keep you from appreciating what you have. Even if your circumstances are humble, maybe you have a warm bed to sleep in and a favorite comforter. You have a shower with hot running water. You can go into your kitchen and make yourself a nice cup of tea. Not everyone can say the same. Think about your family and/or friends, your support system. As the busy days go by, sometimes we all forget what we mean to each other. Don’t let today be one of them. Today’s card is the Ten of Pentacles. This seems to be the week for you to receive good things and to appreciate the goodness in your life. Take 1 or 2 minutes out of your day to acknowledge the good things in your life. Get out a piece of paper and write down as many as you can think of. Then, keep that paper in your pocket or purse for at least the rest of the day. Let today be the day that good thoughts overshadow any worries you have. Good morning, all! Today’s card is the Ten of Pentacles. There are a couple of key words for today. The first is “abundance.” With the Ten of Pentacles, we can celebrate abundance in our lives. The abundance can be in the form of money or material possessions. But it may be in small ways that are not so obvious. Did you just redecorate your bedroom? Or maybe you bought yourself some new shoes or a new coffee maker. Then again, it does not have to be about material possessions. Maybe your sister or best friend from out of town is visiting for a few days and this makes you feel happy. Maybe your boss let you know that you did a good job at work. There are as many ways to feel abundant as there are people in the world. So don’t be limited by these examples. The second key word for the day is “appreciation.” Look at the abundance you have today, whatever form is comes in. Don’t take it for granted. Be fully in the moment and enjoy what you have. And if you can, share your abundance., even if you can only share the good feeling you have. Do a random act of kindness or simply smile at someone who may not have been expecting to receive one. Spread the love.